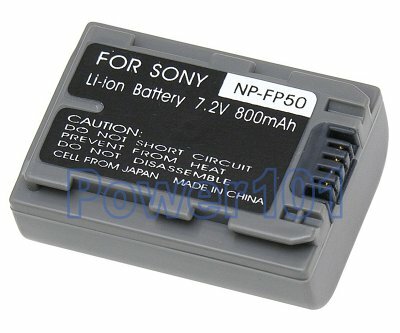 NP-FP50 is the smallest batteriy in the Info-"P" series NP-FP50 NP-FP70 and NP-FP90. FP50 is rated about 2 hours, FP70 around 4 hours, and FP90 around 6-8 hours. Hours vary and depend on LCD and zoom usage. FP50 is the smallers and lightest. FP90 is the largest and heaviest. For average user FP70 is highly recommended over FP50 or FP90. Most on-stage events run longer than 2 hours and an FP50 will not be enough. 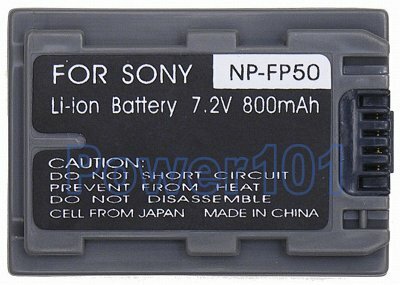 This battery is compatible with the following Sony camcorders: DCD-DVD505, DCR-30, DCR-DV602, DCR-DVD103, DCR-DVD105, DCR-DVD105E, DCR-DVD202, DCR-DVD203, DCR-DVD205, DCR-DVD205E, DCR-DVD304, DCR-DVD304E, DCR-DVD305, DCR-DVD305E, DCR-DVD403, DCR-DVD404, DCR-DVD404E, DCR-DVD405, DCR-DVD405E, DCR-DVD505, DCR-DVD505E, DCR-DVD602, DCR-DVD653, DCR-DVD703, DCR-DVD803, DCR-DVD92, DCR-HC16, DCR-HC17, DCR-HC18, DCR-HC19, DCR-HC20, DCR-HC21, DCR-HC22, DCR-HC23, DCR-HC23E, DCR-HC26, DCR-HC26E, DCR-HC29, DCR-HC30, DCR-HC32, DCR-HC33, DCR-HC35, DCR-HC35E, DCR-HC36, DCR-HC36E, DCR-HC39, DCR-HC40, DCR-HC42, DCR-HC43, DCR-HC46, DCR-HC46E, DCR-HC65, DCR-HC85, DCR-HC94, DCR-HC94E, DCR-HC96, DCR-HC96E, DCR-SR100, DCR-SR40, DCR-SR60, DCR-SR80, HCR-HC21, HCR-HC33, HCR-HC43, HDR-HC3, HDR-HC3E. If your camcorder is not listed, please check our camcorder battery finder to see which battery you need. This battery can be charged by any charger intended for FP50 FP70 or FP90. Such as the charger that may come with your camcorder. It can also be charged on camcorder.